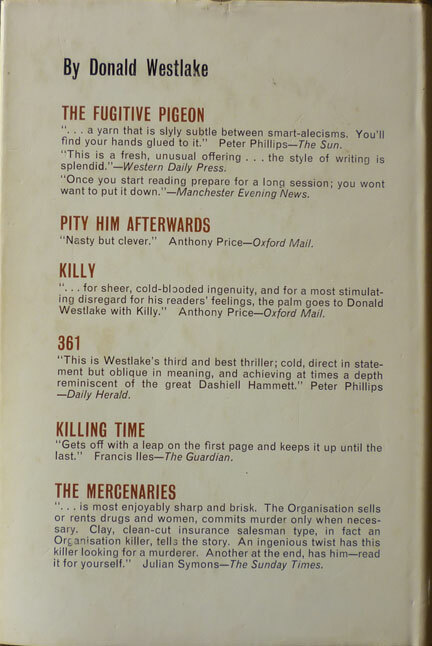 And it's another of the Donald E. Westlake novels published by British publisher T.V. 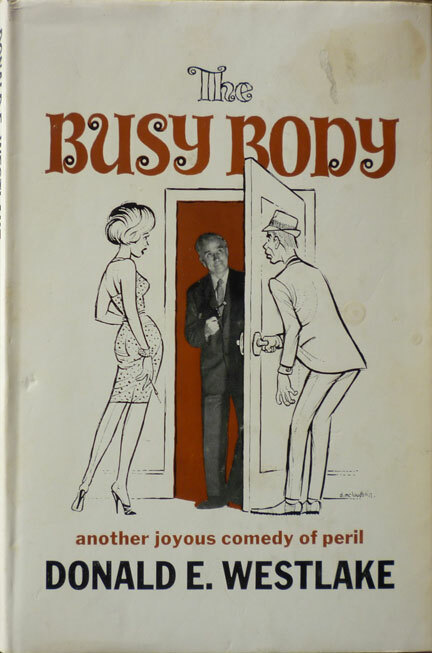 Boardman, in this case the 1966 first edition hardback of The Busy Body. 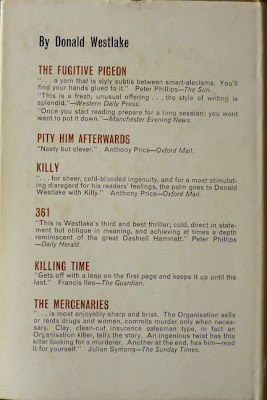 I blogged about the Westlake novel Boardman published before this one, 1965/'66's The Fugitive Pigeon, two weeks ago; unlike that book, however, The Busy Body wasn't published as part of Boardman's American Bloodhound Mystery series, so it's not numbered (although it does have the same drawing of a bloodhound smoking a pipe on the dustjacket spine; had Boardman simply given up on the numbering by this point?). But the ingenious jacket was once again designed by Boardman's art director, Denis McLoughlin, here mixing a cartoony style with photomontage. I wonder who the gentleman in the doorway holding the gun is...? The Busy Body is the second of Westlake's crime caper novels, following The Fugitive Pigeon. This time, though, Westlake adopted the third person rather than the first, for a tale of murder, mystery and graverobbing – or rather, suit robbing. Because it's the task of middle-ranking mobster Aloysius Eugene Engel to dig up recently departed big shot mobster Charlie Brody and retrieve the suit he was buried in, which has heroin sewn into its lining. That is such a great cover. Early Westlake straddled the transition between the straight early 60's and the hippie late 60s and it's cool to see how different covers of the same book can come have entirely different looks. It's also quite American-looking, I think, even though it was done by a Brit. McLoughlin was good at tapping into that sense of Americana in his covers.